This year's resolution…. to not make resolutions. lame, i know… but hear me out. In the past I let my resolutions be reminders about all the things I was BAD at, a nagging list of my failures: cooking, working out, photography, eating healthy, writing thank you letters, washing my face, organizing, picking up the dang phone to call friends… the list goes on and on. I already have a TON on my plate for 2014 - graduating, finding a new job, surviving teacher training, getting married, lots of travel… all mostly exciting things, but things that are sure to keep me plenty busy nonetheless. So this year, I am making a conscious effort to just be the best me. The best fiancé/wife, the best teacher, the best daughter/sister, the best friend that I can be… without letting resolution obligations get in the way. I do have some new "mindsets" that I can't wait to share with you… so stay tuned for that! Anyone else forgoing like moi? Not making resolutions is the only resolution I have kept! Such a great outfit! That skirt is killer! Your posts are always beautiful, but your photography has been so stunning lately! I'm never very good at resolutions so I typically give myself really general reminders like "it's a good idea to drink more waters!" or "be kind to others". I'm with ya, Jessica! I feel like resolutions are just a way of saying we're not "enough" at something, so instead this year I've made a list of fun things I want to experience and accomplish–which I know will only better me along the way! Can't wait to hear what you've come up with! I think this is one of my favorite looks ever. 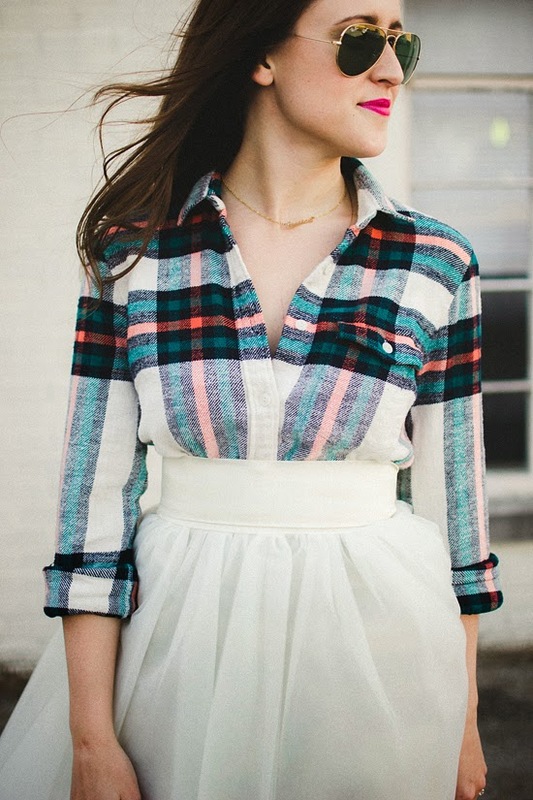 I adore the plaid top with the ultra girly skirt. You are darling! Such gorgeous pictures! I'm loving your photography lately... Stunning outfit! gorgeous photos! and deciding to be the best you that you can be is a great goal for 2014! 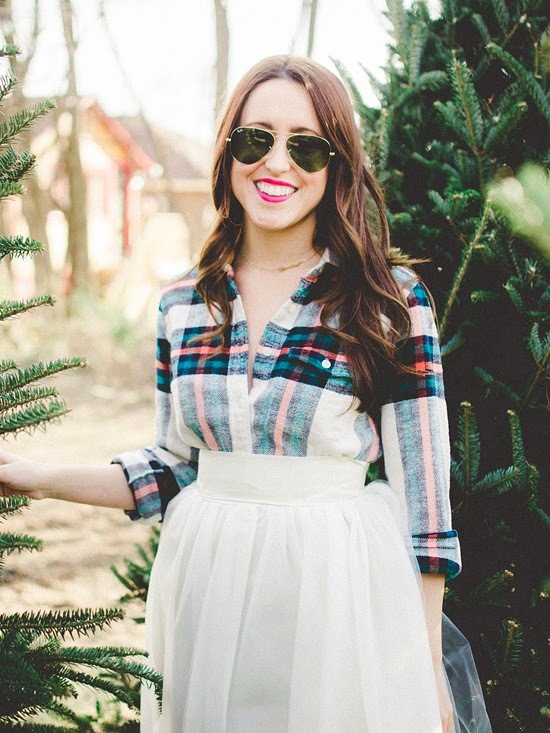 This skirt is gorgeous and I think your mindset about resolutions is perfect for 2014! You got this girl. I don't really do resolutions either, but I am always trying to be the best I can. That skirt is so pretty! Beautiful everything. I don't make resolutions anymore because I break them anyway. Just entered as well. I want to win. I really like this...to just be the BEST you. And also love everything about this outfit...ahhhh!!! so beautiful. 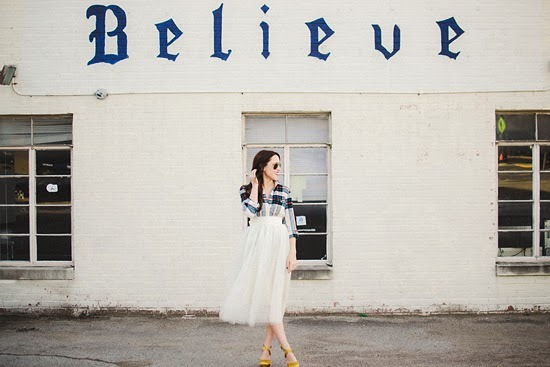 I love the "believe" on that building, is that somewhere in Nashville? I am not really a resolutions kind of girl. I am just hoping to make 2014 the best year yet! That background with "Believe" on it is fabulous! 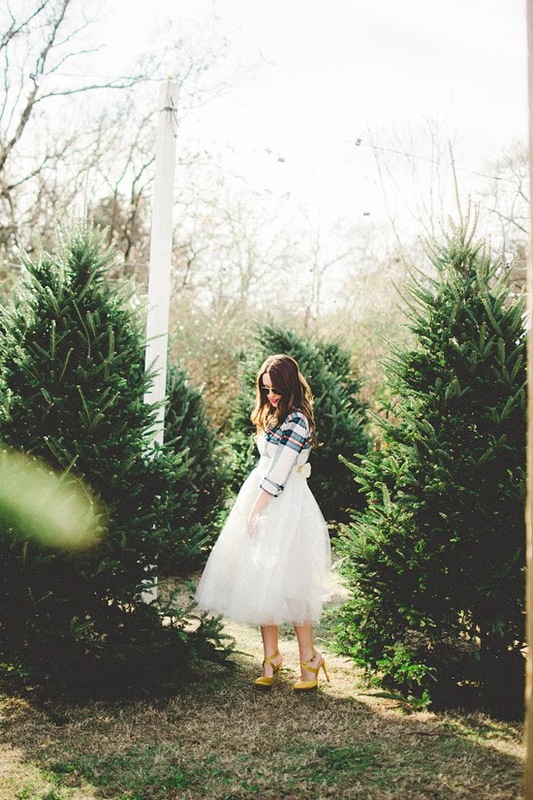 And I love the plaid and tulle together. You look fantastic! What a beautiful look, you turned a causal top into a sophisticated one! Love this look! Wow, that's a really interesting, inspiring, and brave way to really think about resolutions and making a chance in one's life. You right - we need to just be the best us and not nag ourselves with resolutions we don't keep based on our bad we are. 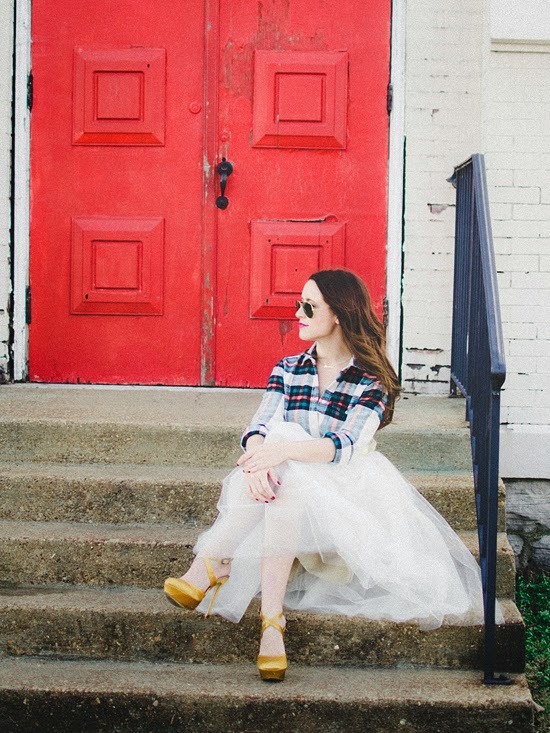 Love me a tulle skirt! Great look Jess! Great away to approach life Jessica! Love this outfit - you are always so chic! So so so pretty! 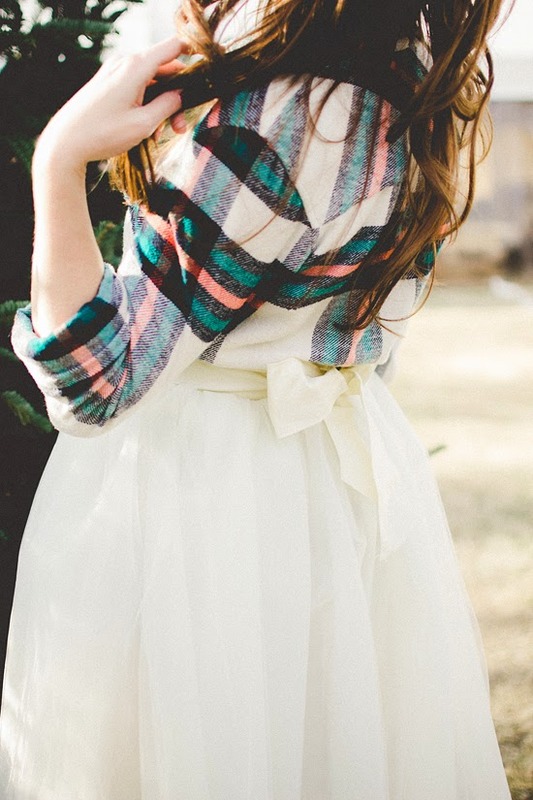 Love the skirt! And these heels, holy pretty! Oh my god I'm in love! Thanks lady! 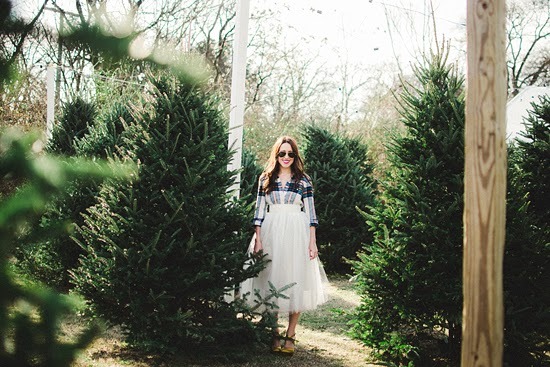 The fun part was asking the grizzly man who ran the Christmas tree farm if I could take fashion pictures in his lot… he had no clue what I was talking about! Ooh, I think your cousin and me would be friends! Thank you lady, I am thankful for meeting wonderful women through blogging, including Zipporah who is now taking the majority of my photos. And yes, I should probably put a post-it on my computer that says "drink more water" too! Ooh I love that - I've always told my boyfriend, now fiancé, that I would rather receive "memories" than gifts… experiences are what stay with us! Aw, thank you so much. If only I could wear Christmas Party attire year around! Thanks! I know, who needs yellow pumps!? But I couldn't resist them! Thank you Anna! I am having so much fun playing around with my new photographer! Thanks lady! I am excited to see what the future holds! Thanks lady! I am such a planner, my un-planned future gives me a touch of anxiety, but I'm pretty dang excited about it too! In my book, it's all about that shoes, always - we would totally be friends! Thanks Amy! I could always do with better organization too. Good luck with your resolution! Thank you Ashley, and thank you for all your support through my blog. Its wonderful women like you that give me the inspiration! Thank you lady! And here here to being resolution free! Yes ma'am - right in the middle of the 12th Ave South neighborhood :) One of my favorites! I agree - this whole "it's January 1st so I have to get my act together" thing is not for me… if you want to change, change… not just based on the calendar! Cheers to being the best us! Aw, thank you lady! I will def be taking teacher style notes from YOU! You're welcome… in advance. Because time will tell that you love it! I love it! I think resolutions are like lent.. temporary bans only backfire into wanting it more. I think working at it over time to be our potentially perfect self is best! :) Cheers to works in progress! I ADORE this post! The outfit, the locations, and the message. Cheers to you! !